We made some big changes at the Depot this year. These included some pretty sophisticated heavy hitters, like a new competency rubric, new data tracking tools and new accountability and support structures. But my favorite change is a bit more basic. Primal, even. It's our new Kitchen Crew. Throughout the year, students cooked breakfast for the whole school every Friday morning. 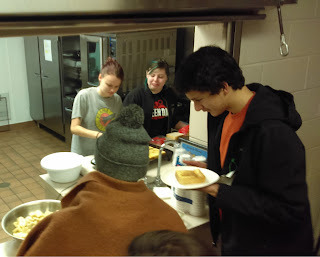 They made pancakes, bacon and eggs, breakfast burritos, skillets, French toast, and some beautiful yogurt parfaits. But the most important thing to come out of that kitchen wasn't pancakes, but a sense of ownership, self-esteem and community. 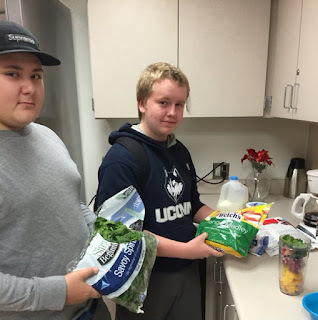 It was exciting to see them in the kitchen, working together, cutting vegetables, turning bacon, flipping French toast, and serving their fellow students over the counter. It was fun to see the line forming, and the students eating together in our little cafeteria. They even expanded the program themselves to include some soups and salads for lunch. Did it take some extra time from the day? Yes. It took a small bite out of instructional time on Friday morning. Did it take some effort on our part? Yes. Ellen met with the students weekly, shopped for food, and supervised every Friday morning. Yes, and it was privately funded. First, food sharing is in our DNA. Primates do it all the time to boost oxytocin, forge bonds and build community. This is why we gather for meals... and share pictures of our food on Facebook when we can't. Our climate survey did not show the positive impact I was hoping for, but there were lots of other things going on this year. Big changes were made, students left, and new students were added. We certainly don't have a controlled experiment, and we have a very small sample size. 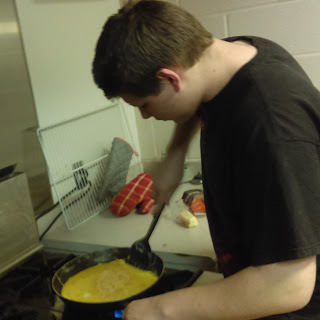 But we do have evidence of positive impact: consistent, voluntary, enthusiastic involvement of 9 students (half our population) throughout the school year, widespread enjoyment of the breakfasts, and these awesome pictures. 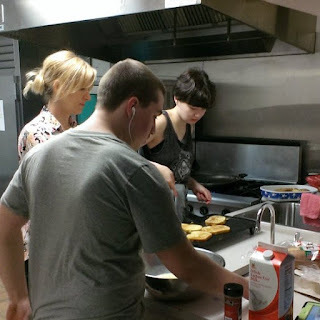 Second, these students are learning to cook and eat wholesome food. OK, pancakes aren't the healthiest, but they're better than fruit loops, Monster drinks and donuts. Plus, the crew made plenty of salads and soups for lunch as well. And it worked. 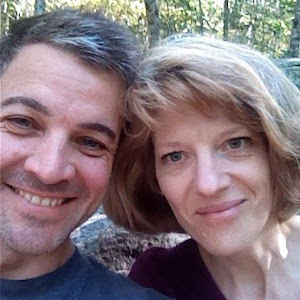 Ellen's enthusiasm and vision for the role of healthy food in their lives was contagious. 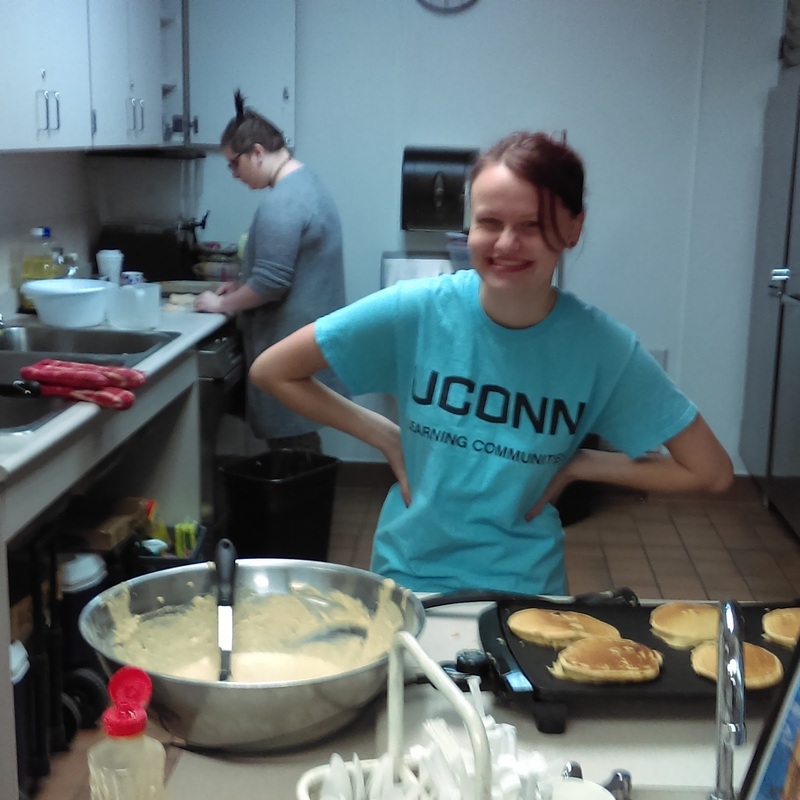 By the end of the year, the teams worked like clockwork, turning out delicious, full breakfasts in half an hour or less. It even carried over into their home lives. One parent told us her daughter has started cooking meals for them at home as a result of her time on the Kitchen Crew! Third, these students are taking ownership of their school and finding a place here, and this is a key aspect of a positive school culture. We've seen the pride they're finding in building their gardens this summer, and I think the Kitchen Crew must feel the same way. They played a real role. Some began asking to cook at other times, and lunchtime soup and salad became a regular occurrence. 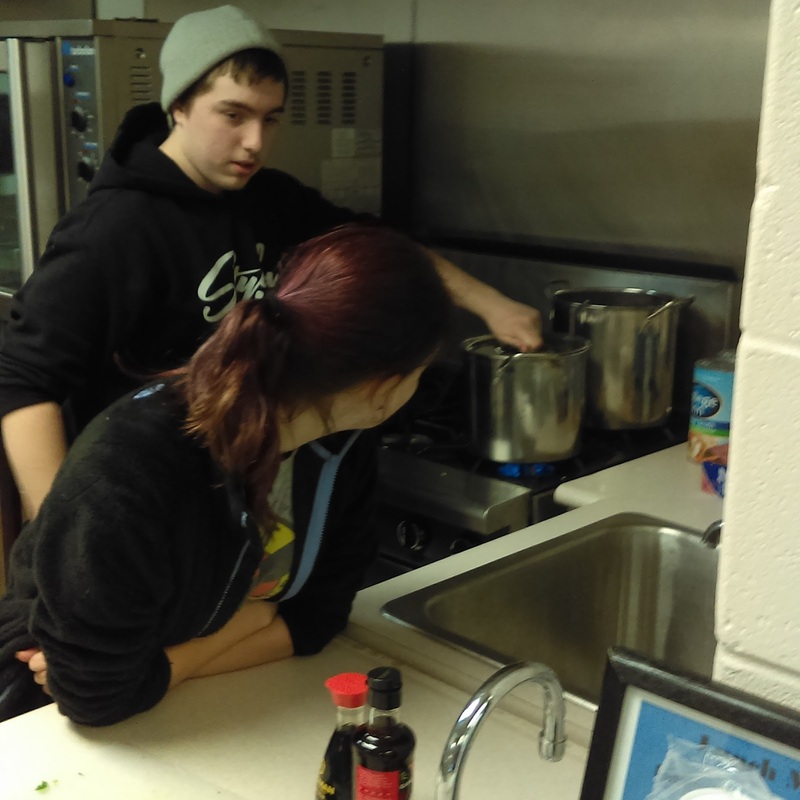 One student even started seeing herself as "the soup lady." Fourth, in addition to basic cooking skills, they gained practice in leadership, cooperation, and collaboration. It wasn't always smooth sailing down there in the kitchen. They had their share of personality clashes and disagreements over who would cook what and how, and they worked through it all. First, data: I need to figure out a way to test whether or not the program really has the positive effects I hope it will, probably by using our life skills rubric, interviews, and more specific questions on the climate survey. Second, credit: I didn't assign the students credit for participation this year, but I plan to do so next year, and base it on mastery of competencies. Third, expand the concept. I want to expand the concept of giving each student a key role at the school. I'm hoping a full time Garden Crew will grow out of our summer garden program, and maybe a Grounds Crew. And I'd love to see a PR Crew make promo videos and stuff! I think all of these would have powerful impacts, but I see the kitchen as always playing a central role. Maybe I'm biased, since this little program is my favorite, but several million years of evolution can't be wrong. 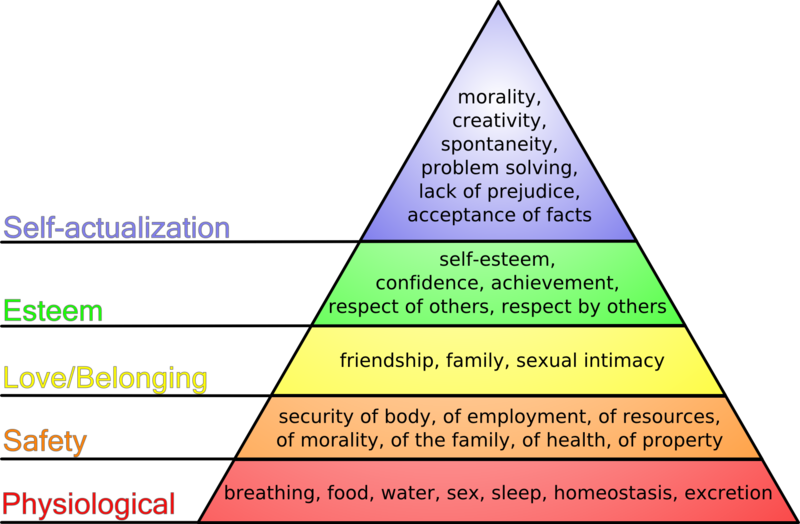 Food is not only at the base of Maslow's pyramid, it can be the basis for higher levels as well, creating a sense of belonging, and boosting self-esteem. I can't help but think that it has and will continue to play a powerful role in these students lives, and make the Depot into and even more powerful and positive place. Top 3 takeaways from my first year in admin.